SGX Day Traders: 2014 May 29-- #sgxdaytraders Follow up post.Congrats all vested and you may join us too. FREE SMS alert with Opening FREE trading account with our SPONSORED Remisier! 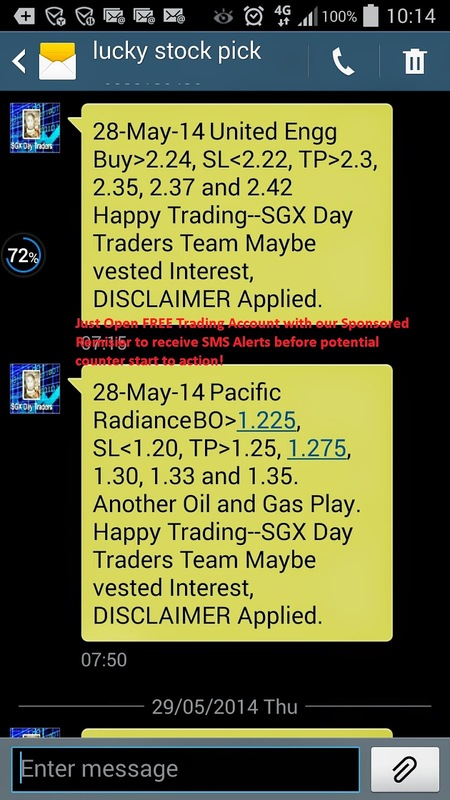 2014 May 29-- #sgxdaytraders Follow up post.Congrats all vested and you may join us too. FREE SMS alert with Opening FREE trading account with our SPONSORED Remisier! 2014 May 29-- #sgxdaytraders Follow up post on United Engineering Technical Buy call on 2014 May 28. Congrats all vested.Just Open FREE Trading Account with our Sponsored Remisier to receive SMS Alerts before potential counter start to action! Click HERE to Contact us to Open FREE Trading account.